In my online courses, I often post short, weekly quizzes that are graded immediately by Blackboard. There are a few different quiz types that I use for certain things. Key concept quizzes sometimes take students a little more time to figure out on their own, though they may only have 10 multiple choice questions. I make this type of quiz available for a week and give students unlimited attempts at retaking it for a better score. This encourages them to review their notes or consult the text for answers. At the very least, they can guess until they get them all correct. This may seem like it is so easy that it is not purposeful, but this method enables students to print out the key concepts being taught with correct answers for test time. Another quiz type, testing vocabulary, includes twenty multiple choice questions. Students have one chance to take it within 5 days and only 5 minutes to finish it once started. This tests memorization, not the students understanding or analysis of the information. In this way, my quizzes are tailored to demonstrate the importance and purpose of the information that they must learn and how it might look on future tests. Having multiple quiz types is not a new teaching concept; however, teaching online gives you many more options. 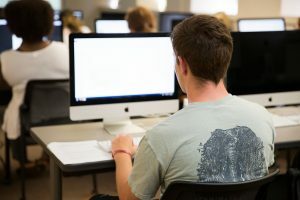 It is also much more convenient for both students and teachers, who would be passing loose pieces of paper back and forth in an on-campus course.